Hydrocarbons in natural oil seeps provide carbon and energy sources for extensive and diverse microbial communities. This chapter provides an introduction to sulfate-reducing, methanogenic, and methane- or alkane-oxidizing anaerobic microbial populations from hydrocarbon-rich marine habitats. Persistent enrichment and cultivation efforts and pure culture studies have greatly increased the recognized diversity of cultured, hydrocarbon-oxidizing microorganisms and the knowledge of their substrate spectra, habitat preferences, and ecophysiological function in their natural environments. This chapter highlights model ecosystems where diverse hydrocarbon-oxidizing microbial communities are sustained by fossil hydrocarbons; characteristic examples are the hydrocarbon seeps in the Gulf of Mexico, where deeply sourced hydrocarbons of Jurassic origin are rising through extensive sediment layers that are fractured by salt tectonics, and the hydrothermal Guaymas Basin in the Gulf of California, where buried organic matter of photosynthetic origin, which is undergoing thermal maturation, is transformed into young petroleum within the upper sediment layers. These examples provide surface expressions of subsurface hydrocarbon reservoirs and their microbiota. The microbial communities in hydrocarbon seeps and reservoirs reflect the spectrum of carbon substrates and electron donors and the wide range of physical conditions that characterize these habitats. Microbial life thrives in marine sediments and in marine hydrocarbon deposits and seeps (Jørgensen and Boetius 2007). As hydrocarbons migrate upward from their deep subsurface source to the sediment-water interface, they fuel benthic hydrocarbon-degrading microbial communities containing physiologically and phylogenetically diverse anaerobes, such as sulfate reducers, methanogens, methane oxidizers, and fermenters. Hydrocarbon-rich habitats provide a hunting ground for detecting and characterizing novel physiological and phylogenetic types of hydrocarbon-degrading bacteria and archaea, as demonstrated already 20 years ago when six novel bacterial phyla were discovered in a 16S rRNA gene sequencing survey of a terrestrial aquifer contaminated with jet fuel-derived hydrocarbons and chlorinated solvents (Dojka et al. 1998). Two contrasting marine hydrocarbon-based ecosystems provide particularly instructive model cases: the hydrothermal sediments of Guaymas Basin in the Gulf of California, where high temperatures and pressure transform photosynthetic biomass embedded in the upper sediment layers into young hydrothermal petroleum, and the Gulf of Mexico, where deeply sourced hydrocarbons of Jurassic origin are rising through massive continental slope sediments that are fractured by salt tectonics. These locations will provide the starting point for exploring the environmental diversity of anaerobic alkane- and aromatics-oxidizing bacteria and archaea that have been obtained from these marine model systems and other hydrocarbon-rich habitats. To place practical limits on this far-ranging subject that could easily be treated more comprehensively and at greater length, this chapter focuses primarily on sulfate-reducing, methane-cycling, short-chain alkane- and aromatics-oxidizing microbial communities. The Guaymas Basin in the Gulf of California is a young marginal rift basin characterized by active seafloor spreading and rapid deposition of photosynthetic biomass and phytoplankton, in particular diatoms, from highly productive overlying waters, supplemented locally by terrigenous sedimentation from the Sonora Margin (Calvert 1966; Schrader 1982). The northern and southern axial troughs of Guaymas Basin are bounded by extensive axial-parallel fault lines on both sides (Lonsdale and Becker 1985; Fisher and Becker 1991). Organic-rich sediments of several hundred meters thickness overlie the spreading centers of Guaymas Basin and alternate with shallow intrusions of doleritic sills into the unconsolidated sediments (Einsele et al. 1980). Whereas spreading centers at mid-ocean ridges lacking sediment cover favor focused magma emplacement and exposure to cold seawater directly at the spreading center, the sediments in Guaymas Basin act as a thermal blanket that allows broader off-axis magmatism which extends into axial-parallel faults (Berndt et al. 2016) and the sedimented ridge flanks (Lizarralde et al. 2011). Emplacement of hot sills indurates and hydrothermally alters the sediment layers above and below the sill; buried sills continue to shape hydrothermal circulation patterns and reaction pathways (Saunders et al. 1982; Gieskes et al. 1982; Kastner 1982). This juxtaposition of active seafloor spreading, sill emplacement, and rapid sedimentation creates a dynamic environment where physical, chemical, and microbiological processes regulate the cycling of sedimentary carbon, in particular the synthesis, mobilization, and microbial utilization of fossil hydrocarbons. Buried organic matter in the Guaymas sediments is heated at ca. 300 °C under high pressure and transformed quickly into hydrocarbons, a hydrothermal process that has also been studied in the laboratory (Seewald et al. 1994). Guaymas Basin petroleum is young enough to be 14C-dated; it has an average radiocarbon age of approximately 5000 years (Peter et al. 1991). Hydrothermal pyrolysis transforms and mobilizes a major proportion of subsurface carbon sources: The organic carbon content of approx. 3–4 wt% in surficial Guaymas Basin sediments (De la Lanza-Espino and Soto 1999) is reduced to 1–2% in indurated and heated subsurface sediments below sills (Rullkötter et al. 1982; Simoneit and Bode 1982). Mobilization and expulsion of sedimentary organic matter by hydrothermal heating are also evident in surficial sediments of Guaymas Basin (Lin et al. 2017). The resulting, hydrothermally altered fluids that are reaching the sediment surface are enriched in thermally generated hydrocarbons that are derived from buried organic matter; these include aromatic compounds, alkanes and methane (Galimov and Simoneit 1982; Kawka and Simoneit 1987; Whelan et al. 1988; Welhan et al. 1988; Bazylinski et al. 1988; Didyk and Simoneit 1989), and low-molecular-weight organic acids (Martens 1990). Transport of hydrocarbon-rich fluids through the upper sediment column and to the sediment-water interface directly links geological, physical, and biogeochemical processes by providing fossil carbon substrates to a highly active, benthic microbial ecosystem (Pearson et al. 2005). Highly active and complex benthic microbial communities occur within a narrow, near-surface sediment horizon (Götz and Jannasch 1993; Guezennec et al. 1996; Teske et al. 2002; Teske et al. 2003; Edgcomb et al. 2002; Biddle et al. 2012; McKay et al. 2012, 2016). Upward substrate and temperature fluxes in Guaymas Basin create a spatially compressed zone of anaerobic microbial processes and communities just below and on the sediment surface, including methanogenesis (Welhan et al. 1988), anaerobic methane oxidation (Kallmeyer and Boetius 2004), sulfate reduction (Elsgaard et al. 1994; Jørgensen et al. 1990, 1992; Kallmeyer et al. 2003; Weber and Jørgensen 2002), and sulfide oxidation (Jannasch et al. 1989; Nelson et al. 1989; Gundersen et al. 1992). These hot spots of microbial activity reflect the subsurface flow patterns and localized supply of organic substrates and inorganic electron donors in Guaymas Basin sediments; visual inspection and subsequent geochemical and microbiological analysis of conspicuous mat-covered sediments show a complex landscape of sulfide-oxidizing microbial mats on hydrothermal sediments with sulfate-reducing and methane-cycling communities (McKay et al. 2012, 2016; Teske et al. 2016). Interestingly, the hydrothermal sediments and seafloor mineral concretions that are rich in alkanes [beyond methane] and liquid petroleum often lack the conspicuous overgrowth of white, yellow, and orange microbial mats and instead show muted, light-gray or off-white surface dustings with a powdery-looking texture and the occasional lime-yellow patches of elemental sulfur (Fig. 1). In such cases, not microbial mat growth, but sulfur accumulation at the sediment-water interface may dominate the surface color and appearance (Teske et al. 2016). Briefly summarized for introductory purposes, these sediments are the source of numerous sulfate-reducing hydrocarbon oxidizers, often thermophilic or thermotolerant isolates, such as the decane-oxidizing bacterium Desulfothermus naphthae strain TD3 (Rüter et al. 1994), a propane-oxidizing bacterial enrichment dominated by Desulfotomaculum strain Propane60-GuB (Kniemeyer et al. 2007), thermophilic methane-oxidizing archaeal enrichments dominated by members of the anaerobic methane-oxidizing (ANME-1) archaeal lineage (Holler et al. 2011, Wegener et al. 2015), by the thermophilic butane-oxidizing archaeon Candidatus Syntrophoarcheum sp. (Laso-Pérez et al. 2016), and by the thermophilic, hydrogenotrophic sulfate-reducing bacterium Candidatus Desulfofervidus auxilii that grows in syntrophic association with methane- and butane-oxidizing archaea (Krukenberg et al. 2016). Mesophilic sulfate-reducing isolates from Guaymas Basin include the n-butane and propane oxidizer BuS5 within the family Desulfobacteraceae (Kniemeyer et al. 2007), and strain EbS7 within the Desulfatiglans lineage, capable of complete oxidation of ethylbenzene (Kniemeyer et al. 2003). Stable isotope labeling experiments with butane and dodecane have identified phylotypes forming sister lineages to the genera Desulfosarcina, Desulfococcus, and Desulfonema within the Desulfobacteraceae (Kleindienst et al. 2014). Sequence-based screening of aromatics [benzene] enrichments from Guaymas Basin sediments has recovered further sequences of the Desulfobacteraceae and the Desulfatiglans lineage (Phelps et al. 1998) (Fig. 1). The sediments of the continental slope of the northern Gulf of Mexico contain large reservoirs of petroleum and gas that sustain an arc of seafloor hydrocarbon seeps from offshore Mississippi to Texas. These seafloor environments are characterized by petroleum leakage and channelized gas flux and ebullition from the seafloor (Kennicutt et al. 1988), methane-soaked seep sediments dominated by anaerobic methane oxidation (Lapham et al. 2008), seafloor methane hydrate formation (Brooks et al. 1984; Sassen et al. 1999) often in association with oil seepage (Brooks et al. 1986), sediment and gas flow from large seafloor mud volcanoes (McDonald et al. 2000), and methane-derived authigenic carbonates (Roberts et al. 2010a). Frequently, hydrocarbon seepage on the continental slope of the northern Gulf of Mexico shows admixtures of subseafloor brine. The Mid-Jurassic Louann evaporite formation, predominantly halite, extends from Texas to the Florida panhandle underneath the northern Gulf slope, coast, and coastal plain (Amos 1987). These salt formations have a lower density than the overlying compacted marine sediments (Lerche and Petersen 1995); since they are incompressible, they gradually move and buckle upward through the surrounding and overlying sediment layers and create structurally complex salt dome crests and mounds in the overlying seafloor (Roberts et al. 1990) that result in a highly conspicuous and characteristic, topsy-turvy seafloor bathymetry (Bryant et al. 1990). Fractures within the overlying sediment then provide a network of pathways for upward migration of subsurface hydrocarbons (Roberts et al. 1999). In consequence of their prolonged contact with subsurface salt formations, rising hydrocarbon-rich seep fluids can be highly saline; they collect in seafloor depressions as quiescent, anoxic hydrocarbon-rich brine lakes with a stable halocline and redoxcline at the brine/seawater interface that favors colonization by chemosynthetic invertebrate communities, for example, extensive mussel banks (MacDonald et al. 1990). Under more active flow conditions, hydrocarbon-rich brines entrain fluidized sediments and create pulsating saline mud volcanoes that frequently overflow their seafloor basin and send a network of briny rivulets running downslope over the surrounding seafloor (McDonald et al. 2000; Joye et al. 2005). Seafloor brine lakes and mud volcanoes can transition into each other; a currently quiescent brine lake can have a dynamic past as a mud volcano (MacDonald and Peccini 2009) and can again erupt as a mud volcano after extended quiescence or in irregular intervals (MacDonald et al. 2000). Obviously, briny seafloor lakes and mud volcanoes provide habitat for halophiles and extreme halophiles and select for halophilic or at least halotolerant variants of hydrocarbon-utilizing or chemosynthetic bacteria and archaea (Lloyd et al. 2006; Joye et al. 2009). In some cases, benthic hydrocarbon seepage in the Gulf of Mexico is visible even from the sea surface. The Green Canyon 600 area on the upper continental slope of the Gulf of Mexico harbors a seafloor ridge with the most productive natural oil seeps in the northern Gulf of Mexico, also known as Oil Mountain. Here, oil and gas bubbles rising from the seafloor at 1200 m depth produce prolific oil slicks that extend for tens of kilometers on the sea surface and are visible from space (Garcia-Pineda et al. 2010). 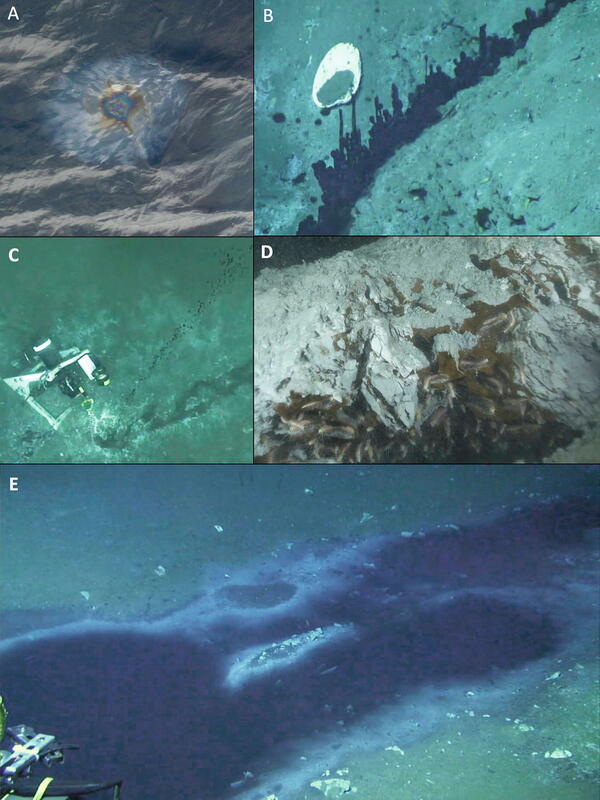 The rough seafloor topography with many small mounds and valleys harbors patches of microbial mats, vesicomyid clams, and vestimentiferan tube worms; the seafloor landscape shows hydrocarbon seepage in all its manifestations (Fig. 2). Hydrocarbons are staining surface-breaching gas hydrates so that partially exposed seafloor hydrates stand out in a rich petroleum brown against the lighter-colored sediment cover. Streams of oil-coated gas bubbles emerge through cracks in carbonate pavement, and oil droplets are seeping from the sediment in low-lying pockmarks (Roberts et al. 2010b; Johansen et al. 2017) (Fig. 2). In contrast to Guaymas Basin, the potential of the Gulf of Mexico for isolating hydrocarbon-oxidizing bacteria and archaea, including halophilic or halotolerant types, is mostly untapped. Molecular surveys have detected highly diverse deltaproteobacterial sulfate-reducing bacteria (Joye et al. 2009; Lloyd et al. 2006, 2010). Sulfate-reducing enrichments with ethane, propane, and n-butane have yielded the n-butane-oxidizing enrichment Butane12-Gm2 and the propane-oxidizing enrichment Prop12-GMe, both related to Desulfosarcina/Desulfococcus (Kniemeyer et al. 2007; Jaekel et al. 2013). Compared to the closely related butane-oxidizing strain BuS5 from hydrothermal Guaymas Basin, these propane- and butane-oxidizing enrichments from Gulf of Mexico cold seeps had a lower optimum temperature for sulfate reduction, 15–20 °C instead of 25–30 °C (Jaekel et al. 2013). Renewed cultivation efforts after the Deepwater Horizon oil spill have focused mostly on aerobic hydrocarbon oxidizers from the water column and weathered surface oil, such as the alphaproteobacterium Tritonibacter horizontis, capable of degrading substituted aromatics (Giebel et al. 2016; Klotz et al. 2018), or the obligate polyaromatics oxidizer Cycloclasticus and gammaproteobacterial marine heterotrophs with alkane-degrading capabilities (Gutierrez et al. 2013). Cycloclasticus populations have also been detected as endosymbionts in mussels and sponges from asphalt-rich Gulf of Mexico hydrocarbon seeps, with the additional twist that these symbiotic communities subsist on short-chain alkanes (Rubin-Blum et al. 2017). Sedimentation of oil-derived marine snow on the seafloor in the Gulf of Mexico in the fall of 2010 has enriched for sulfate- and metal-reducing bacteria of the Desulfobacteraceae, Desulfobulbaceae, and Geobacteraceae (Kimes et al. 2013; Yang et al. 2016). It is intriguing to speculate that these bacteria could have been enriched from seed populations in natural hydrocarbon seeps and have catalyzed benthic hydrocarbon degradation and bioremediation as a natural microbial ecosystem response. The hot and cold hydrocarbon seeps of Guaymas Basin and the Gulf of Mexico can be viewed as surface expressions of subsurface hydrocarbon reservoirs. Fermentative bacteria occurring in petroleum reservoirs include numerous mesophilic, thermophilic, and halophilic strains and species (reviewed in Magot et al. 2000 and Grassia et al. 1996). Pure culture isolates from petroleum reservoirs include mesophilic strains (mostly genus Desulfovibrio; Tardy-Jacquenod et al. 1996) and thermophiles, especially members of the gram-positive genus Desulfotomaculum and the thermophilic species Thermodesulforhabdus norvegicus (Beeder et al. 1995), Thermodesulfobacterium mobile (Rozanova and Pivovarova 1988), and Desulfacinum infernum (Rees et al. 1995). The thermophilic sulfur- and thiosulfate-reducing, fermentative genera Geotoga, Petrotoga, and Thermotoga are consistently isolated from deep oil fields and appear to be specialized for this habitat (Davey et al. 1993; Jeanthon et al. 1995; Ravot et al. 1995). Petroleum reservoirs have potential for cultivating new lineages of bacteria, for example, the manganese- and iron-reducing thermophile Deferribacter thermophilus (Greene et al. 1997). Many thermophilic sulfate and sulfur reducers are not limited to petroleum reservoirs; their carbon substrate spectra or other physiological features are broadly compatible with this habitat but are not highly specific. For example, thermophilic sulfate reducers of the genus Desulfotomaculum are commonly isolated from a wide range of subsurface habitats, with and without petroleum hydrocarbon sources (reviewed in Amend and Teske 2005). Hyperthermophilic archaea of the fermentative, sulfur-reducing genus Thermococcus and Pyrococcus and of the sulfate-reducing genus Archaeoglobus occur in high abundance in deep oil reservoirs around the world (Stetter et al. 1993; Beeder et al. 1994; L’Haridon et al. 1995; Orphan et al. 2000) as well as in hydrothermal vents at mid-ocean spreading centers (Kelley et al. 2002). Organic substrates that sustain thermophilic microbial populations do not have to undergo hydrothermal processing or fossil hydrocarbon formation. Organic-rich marine subsurface sediments consistently support subsurface life (Parkes et al. 2000). Buried organic matter of photosynthetic origin provides the carbon source for ubiquitous microbial life in marine sediments, as demonstrated for cool continental margin subsurface sediments (Biddle et al. 2006). Even under moderate geothermal heating, recalcitrant buried organic matter in marine sediments undergoes thermal maturation toward greater bioavailability (Wellsbury et al. 1997). Interestingly, 16S rRNA sequencing surveys show that Thermococcus and Pyrococcus spp. can sometimes be found in deep marine subsurface sediments (Inagaki et al. 2006; Roussel et al. 2008), where they could survive on buried organic compounds undergoing thermal maturation. These occurrence patterns suggest a marine geothermal habitat network that includes hydrothermal vents, subsurface petroleum reservoirs, and deep subsurface sediments. When sulfate is available via seawater inmixing, downward diffusion, or through dissolution of subsurface salt formations and buried evaporates, sulfate-reducing bacteria are thriving in petroleum deposits, hydrocarbon seeps, methane hydrates, petroleum-rich hydrothermal sediments, oil storage tanks, and hydrocarbon-contaminated sediments. The highly diverse sulfate-reducing bacterial communities in these habitats share some broadly characteristic features. Four 16S rRNA gene clusters of sulfate-reducing bacteria, the SEEP-SRB lineages, are consistently found in methane- and alkane-rich seep habitats (Knittel et al. 2003): the SEEP-SRB1 cluster within the Desulfobacteraceae which are generally capable of oxidizing a wide range of substrates, including acetate and CO2, the independently branching and currently uncultured SEEP-SRB2 lineage which often co-occurs with anaerobic methane-oxidizing (ANME) archaea and has been implicated in alkane oxidation due to its consistent occurrence at alkane-rich seeps (Kleindienst et al. 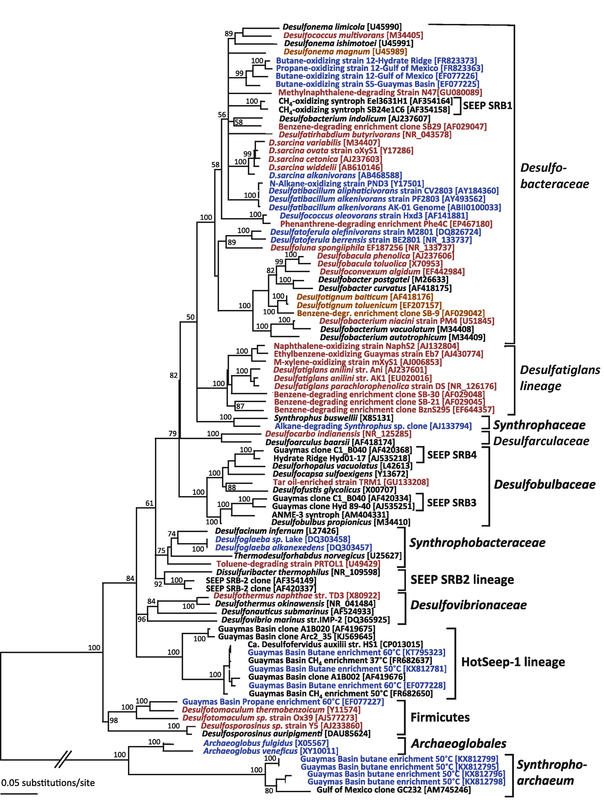 2012), and the SEEP-SRB3 and SEEP-SRB4 groups within the Desulfobulbaceae (Fig. 3) where the Seep-SRB3 lineage is related to syntrophs of the methane-oxidizing archaeal lineage ANME-3 (Lösekann et al. 2007). Fluorescence in situ hybridization (FISH) studies of sulfate-reducing bacteria have identified members of the Desulfobacteraceae (including but not limited to SEEP-SRB1) as the dominant group of sulfate-reducing bacteria in seep habitats that are rich in short-chain alkanes (Kleindienst et al. 2012); members of the Desulfobacteraceae were also abundantly and consistently detected in propane and butane enrichments analyzed via Nano-SIMS and stable-isotope probing with isotopically labeled alkane substrates (Jaekel et al. 2013; Kleindienst et al. 2014). These results are consistent with numerous 16S rRNA and functional gene sequencing surveys that detect predominantly members of the Desulfobacteraceae in marine hydrocarbon seep environments (Dhillon et al. 2003; Lanoil et al. 2001; Lloyd et al. 2006; Mills et al. 2003, 2004, 2005; Teske et al. 2002). Hydrocarbon- and petroleum-degrading sulfate-reducing communities are compositionally overlapping with those that participate in the syntrophic, sulfate-dependent oxidation of methane to CO2 (Orphan et al. 2001a, b; Orphan et al. 2002; Niemann et al. 2006; Lösekann et al. 2007). In particular members of the SEEP-SRB1 cluster related to the genera Desulfosarcina and Desulfococcus overlap with syntrophs of the methane-oxidizing archaea lineages ANME-1 and ANME-2. Highly resolved group-specific FISH and sequencing analyses have identified subgroups of SEEP-SRB1, with the ANME syntrophs clustering specifically in subgroup SEEP-SRB1a (Schreiber et al. 2010); this subgroup is the best example for Desulfobacteraceae that are highly specialized and adapted to a syntrophic lifestyle in methane oxidation. Sulfate-reducing degraders of other hydrocarbons can be found in other subclusters, outside the SEEP-SRB1 group but still within the Desulfobacteraceae, as indicated by FISH studies of alkane-rich marine seep sediments (Kleindienst et al. 2012). In habitats that are rich in complex petroleum-derived substrates, most of the in situ sulfate-reducing activity is coupled to the oxidation of non-methane substrates, for example, low-molecular-weight organic acids (Orcutt et al. 2005; Bowles et al. 2011). The sulfate-reducing community reflects this wide spectrum of substrates and includes numerous types of Deltaproteobacteria instead of, or in addition to, sulfate reducers participating in methane oxidation as archaeal syntrophs (Lloyd et al. 2006, 2010). Novel sulfate-reducing bacteria that oxidize petroleum compounds, such as alkanes and aromatic compounds, are specifically adapted to hydrocarbon-rich habitats. The petroleum-rich hydrothermal sediments of Guaymas Basin, of the Gulf of Mexico, and of hydrocarbon-contaminated marine sediments have yielded sulfate-reducing bacteria that specialize in the complete anaerobic oxidation of short-chain alkanes to CO2. Most of the currently known alkane-oxidizing sulfate-reducing bacteria are related to the cultured genera Desulfosarcina, Desulfococcus, and Desulfonema within the Desulfobacteraceae (Fig. 3). Within the genus Desulfosarcina, the new alkane-oxidizing species Desulfosarcina alkanivorans strain PL12 and the new p-xylene-degrading species Desulfosarcina widdelii strain PP31 have been isolated and described from oil-polluted marine sediments in Kuwait (Watanabe et al. 2017). An alkane-degrading species of the genus Desulfococcus, D. oleovorans strain Hxd3, has been isolated on hexadecane (Aeckersberg et al. 1991). The two butane-oxidizing strains Butane 12-Gme, the dominant component of an enrichment culture from the Gulf of Mexico, and pure culture strain BuS5 from Guaymas Basin (Kniemeyer et al. 2007) are closely related to Desulfosarcina and Desulfococcus spp., but they remain currently without genus and species designation. Several alkane oxidizers with near-identical 16S rRNA sequences fall into the new genus Desulfatibacillum: the two species D. aliphaticivorans and alkenivorans (Cravo-Laureau et al. 2004a, b) and the alkane-oxidizing sulfate-reducing strains Pnd3 (Aeckersberg et al. 1998) and AK-01 (So and Young 1999). These cultured members of the genus Desulfatibacillum oxidize alkanes in the C12–C23 range and alkenes in the C8–C23 range, with species-specific length preferences. The genus and species Desulfatiferula olefinivorans isolated from oil refinery wastewater incompletely oxidizes long-chain (C14–C23) alkenes and fatty acids (Cravo-Laureau et al. 2007). The second species of this genus, Desulfatiferula berrensis, was isolated from oil-polluted estuarine sediments and has a similar substrate profile with C12–C20 n-alkenes (Hakil et al. 2014). This polyphyletic diversity of alkane oxidizers within the Desulfobacteraceae, and their phylogenetically intertwined position among many aromatics-degrading strains and bacteria that do not degrade hydrocarbons (Fig. 2), shows that the molecular detection of alkane oxidizers is not possible on the basis of 16S rRNA sequences alone or remains at the least ambiguous. Almost certainly, hydrocarbon oxidizers are hiding in plain sight among diverse 16S rRNA phylotypes of the Desulfosarcina/Desulfococcus group and other deltaproteobacterial lineages that are typically recovered from marine sediments (Lloyd et al. 2006; Klepac-Ceraj et al. 2004). Long- and short-chain alkane oxidation is not limited to members of the Desulfobacteraceae (Fig. 3). The decane-oxidizer Desulfothermus naphthae (strain TD3) from Guaymas Basin forms a separate phylogenetic lineage that shares a root with Desulfovibrio spp. (Rüter et al. 1994). The Firmicutes include the propane-oxidizing thermophilic Desulfotomaculum strain Propane60-GuB from Guaymas Basin (Kniemeyer et al. 2007) and the phenol-, toluene-, and benzoate-oxidizing, sulfate- and arsenate-reducing Desulfosporosinus strain Y5 from freshwater lake sediments (Liu et al. 2004). The Firmicutes are likely to be involved in hydrocarbon oxidation; for example, sulfate reducers of the genus Desulfotomaculum are commonly isolated from a wide range of subsurface habitats, often with petroleum hydrocarbon sources (reviewed in Amend and Teske 2005). Two strains of the new genus and species Desulfoglaeba alkanexedens, isolated from an oily wastewater storage facility and from oil field production water, specialize in the complete oxidation of C6–C12 n-alkanes and selected organic acids; these strains belong to the family Syntrophobacteraceae within the Deltaproteobacteria (Davidova et al. 2006). Enrichments and pure culture isolation have solved the riddle of a deeply branching bacterial lineage that was originally found in clone library surveys of Guaymas Basin sediments (clones A1B020 and A2B002, Teske et al. 2002). This bacterial lineage appeared again in thermophilic enrichments at 60 °C from Guaymas Basin sediments where n-butane had been added as substrate (Kniemeyer et al. 2007). Subsequently, FISH analysis of thermophilic Guaymas Basin enrichments with methane and sulfate revealed that bacteria of this lineage – subsequently termed the HotSeep-1 group (Fig. 3) – formed syntrophic associations with ANME-1 archaea; the HotSeep-1 bacteria had obviously replaced the syntrophic Desulfobacteraceae that are commonly found at cool temperatures (Holler et al. 2011). In follow-up studies of this syntrophic association, the Hotseep-1 bacteria were discovered to form pili-like cell-to-cell conduits for direct electron exchange with their ANME-1 partners (Wegener et al. 2015). Subsequently, the HotSeep-1 bacteria were found growing in syntrophic association with butane-oxidizing archaea, the euryarchaeon Candidatus Syntrophoarchaeum spp. (Laso-Pérez et al. 2016); the syntrophic role of HotSeep-1 bacteria is to channel the electrons obtained by its butane-oxidizing archaeal partner to the terminal electron acceptor sulfate (see Sect. 10). While the archaeal butane oxidizers so far require co-culture with their Hotseep-1 syntrophs, this bacterium was also isolated in pure culture and described as the thermophilic, hydrogenotrophic sulfate reducer Candidatus Desulfofervidus auxilii (Krukenberg et al. 2016); this is the first time that a sulfate-reducing bacterial syntroph of archaeal methane and alkane oxidizers could be isolated and maintained separately from its archaeal partner. It is possible that this ability to change from a free-living to a syntrophic, consortial lifestyle favors Candidatus Desulfofervidus auxilii in its natural habitat and explains the widespread occurrence of this bacterium in the hydrothermal sediments of Guaymas Basin; its 16S rRNA genes are consistently found in bacterial clone library surveys of diverse Guaymas Basin sediments (Dowell et al. 2016). Exploring the physiology, genomics, and habitat preferences of sulfate-dependent, syntropic short-chain alkane-oxidizing consortia is work in progress; a greater range of seep habitats should be targeted and surveyed. For example, Candidatus Syntrophoarchaeum is not limited to Guaymas Basin; closely related 16S rRNA genes [but not those of Candidatus Desulfofervidus auxilii] have been found in brine seeps in the Gulf of Mexico (Genbank No. AM745246; Orcutt et al. 2010). It is also possible that Candidatus Desulfofervidus auxilii could be replaced by yet another type of alkane-oxidizing syntroph, to accommodate local thermal and geochemical regimes (Fig. 3). The thermal range of bacterial/archaeal syntrophic consortia in Guaymas Basin that oxidize short-chain alkanes and methane is surprisingly broad; Candidatus Desulfofervidus auxilii formed methane-oxidizing consortia with ANME-1 archaea in enrichment cultures at 37 °C (Kellermann et al. 2012) and at 50 °C (Holler et al. 2011; Wegener et al. 2015), in addition to forming butane-oxidizing consortia at 60 °C (Kniemeyer et al. 2007; Laso-Pérez et al. 2016); the upper thermal range, at least for Hotseep-1/ANME-1 consortia, appears to be near 70 °C (Holler et al. 2011). Supporting evidence for a broad, mesophilic to thermophilic range of short-chain alkane and methane oxidation comes from biogeochemical field observations in Guaymas Basin. Extensive δ13C measurements of pore water methane from the southern Guaymas vent field indicated a hydrothermal baseline near −42‰ for methane produced by pyrolysis of buried organic matter (McKay et al. 2016), similar to previous measurements (−43‰ to −51‰; Welhan 1988). More positive δ13C values for methane begin to appear under the influence of microbial methane oxidation at temperatures below ca. 70–75 °C and persist throughout the moderately thermophilic and mesophilic range (McKay et al. 2016). Short-chain alkanes [ethane to hexane] show heavier δ13C values, in the case of ethane reaching even positive values near +5‰ in a moderately heated sediment core with in situ temperatures below 40 °C; these results suggest the isotopic imprint of microbial oxidation that selectively removes isotopically lighter alkanes (Dowell et al. 2016). Most interestingly, the hyperthermophilic sulfate-reducing archaeon Archaeoglobus fulgidus (type strain VC-16) was shown to grow on a wide range of alkenes (C12–C21, n-alk-1-enes) and fatty acids, as well as n-alkanes (C10–C21) at 70 °C, provided that the incubation times were extended to 1 to 2 months (Khelifi et al. 2010, 2014). A largely unexplored role for the Archaeoglobales in alkane degradation is further supported by the intriguing observation that thermophilic methanogenic enrichments oxidizing long-chain alkanes in the absence of sulfate were dominated by members of the Archaeoglobales (Mbadinga et al. 2012). Molecular monitoring of enrichments for aromatics-degrading, specifically alkylbenzene-oxidizing, sulfate reducers has shown that the sulfate-reducing communities that grow on these substrates in crude oil belong to the Desulfobacteraceae, a family of Deltaproteobacteria that remineralizes a wide range of carbon substrates completely to CO2; members of the deltaproteobacterial order Desulfovibrionales constitute a minority in such enrichments (Rabus et al. 1996). These results are consistent with the well-known substrate range of cultured species; for example, the species Desulfosarcina variabilis, Desulfobacterium cetonicum, and Desulfonema magnum within the Desulfobacteraceae can oxidize benzoate, whereas members of the Desulfovibrionales do not (Widdel and Bak 1992). Cultivation efforts have augmented the number of new aromatics-oxidizing strains, species, and genera within the Desulfobacteraceae: the benzoate-, toluene-, and o-xylene-oxidizing strain Desulfosarcina ovata strain oXyS1 from a North Sea oil tank (Harms et al. 1999), the psychrophilic benzoate degrader Desulfoconvexum algidum from arctic sediments (Könneke et al. 2013), and Desulfatirhabdium butyrativorans from an anaerobic bioreactor which degrades various substituted aromatics (Balk et al. 2008). Within the Desulfobacter lineage, the phylotype SB-9 from a Guaymas Basin enrichment on benzene (Phelps et al. 1998) was most closely related to the toluene-, phenol-, or benzoate-oxidizing sulfate reducers Desulfobacula toluolica (Rabus et al. 1993), Desulfobacula phenolica (Bak and Widdel 1986), and Desulfotignum balticum (Küver et al. 2001) from anoxic marine sediments and to the toluene oxidizer Desulfotignum toluenicum from a crude oil reservoir model column (Ommedal and Torsvik 2007). Other phylotypes closely related to these cultured isolates were obtained from marine sediment habitats, such as mud volcanoes (Lösekann et al. 2007). To summarize, the Desulfobacteraceae are not only exceptionally rich in marine alkane-degrading isolates but in aromatics-degrading sulfate reducers as well (Fig. 3). A sister lineage to the Desulfobacteraceae, the Desulfatiglans lineage, consists exclusively of aromatics-degrading sulfate-reducing bacteria that were isolated from a wide range of marine and estuarine sediments and hydrocarbon-processing facilities. Strain EbS7, capable of complete oxidation of ethylbenzene, was isolated from Guaymas Basin sediments (Kniemeyer et al. 2003). This strain is closely related to aromatics-oxidizing counterparts from other marine habitats, the naphthalene oxidizer Naph2S (Galushko et al. 1999) and the m-xylene oxidizing strain mXyS1 (Harms et al. 1999). Together, these three strains – which are not yet formally described as new species or genera – form a distinct deltaproteobacterial phylogenetic lineage that includes the two aromatics-degrading species Desulfatiglans anilini, with two strains AK1 (Ahn et al. 2009) and DSM 4660T, (Kniemeyer et al. 2003), and Desulfatiglans parachlorophenolica (Suzuki et al. 2014). A sediment-free mixed culture enriched from Guaymas Basin sediments with benzene as the sole substrate yielded two phylotypes (SB-21 and SB-30) within this lineage (Phelps et al. 1998). Phylotypes of the Desulfatiglans cluster are frequently and consistently recovered in 16S rRNA and functional gene (dsrAB) clone libraries from marine hydrocarbon seep sediments (Lloyd et al. 2006), marine surface-breaching methane hydrates (Mills et al. 2003; Mills et al. 2005), marine mud volcano sediments (Lösekann et al. 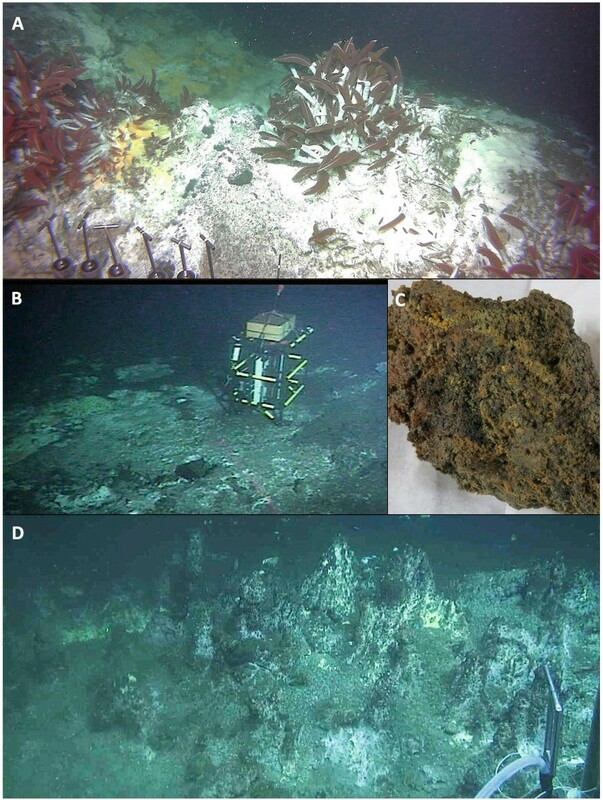 2007), deep marine subsurface sediments (Inagaki et al. 2006), but also estuarine sediments that are rich in plant biomass (Klepac-Ceraj et al. 2004, Bahr et al. 2005). The substrate preferences of the uncultured members of this cluster remain speculative (i.e., plant phenolic compounds) and have to be verified by further enrichment and isolation efforts. At present, the Desulfatiglans lineage is not included among the Desulfobacteraceae in the strict sense (Küver 2014); ultimately it may require description as a new family. The wide spectrum of alkane- and aromatics-degrading sulfate-reducing isolates from hydrocarbon-rich vent sites and cold seep environments clearly shows that the sulfate-reducing community is a major player in the biodegradation of specific petroleum components in nature. Individual sulfate-reducing strains have quite specific substrate requirements and effect only a partial biotransformation of a petroleum sample by selectively removing specific alkanes and aromatics compounds (Bazylinski et al. 1988; Rüter et al. 1994). However, a diversified community of hydrocarbon-oxidizing specialists should be able to alter the alkane and aromatics spectrum of complex hydrocarbon mixtures in petroleum samples profoundly and also exploit synergies in substrate utilization. Hydrocarbon-degrading strains with different substrate specificities that grow in mixed culture and in natural enrichments can combine their degradative capabilities, even to the point of bridging pathway gaps in individual community members that would not be able to grow in isolation. For example, a mixed aerobic community from Gulf of Mexico surface water after the Deepwater Horizon oil spill was used for stable isotope probing experiments with 13C-labeled phenanthrene, naphthalene, and hexadecane, followed by metagenomic analysis of the resulting enrichments. Unexpectedly, obligate alkane-degrading bacteria such as Alcanivorax appeared as dominant community members not only in the hexadecane-degrading enrichments but also in the naphthalene-degrading enrichments (Dombrowski et al. 2016). Although the naphthalene-enriched Alcanivorax population did not harbor complete aromatics-degrading pathways, this population remained sufficiently stable and abundant within the naphthalene-enriched community to contribute a high-quality genome (Dombrowski et al. 2016). These results suggest that hydrocarbon-oxidizing bacteria possessing incomplete hydrocarbon-degrading pathways for a particular substrate can persist in natural enrichments, as long as the microbial consortium as a whole carries the necessary genes and expresses the enzymes that are collectively needed to degrade, oxidize, and assimilate the available hydrocarbons. Sulfate reduction by free-living or syntrophic microorganisms produces hydrogen sulfide and other reduced sulfur species; thus, sulfide is a common occurrence in petroleum reservoirs and hydrocarbon seeps. Its abundance favors the growth of sulfur-oxidizing bacteria as soon as suitable electron acceptors (oxygen, nitrate) become available, commonly by seawater inmixing, groundwater recharge, or drilling operations. For example, a 16S rRNA cloning and DGGE survey of bacterial communities in oil-contaminated groundwater yielded mostly epsilon-proteobacterial phylotypes related to the denitrifying and microaerophilic sulfide oxidizers Sulfurimonas denitrificans and Arcobacter spp. (Watanabe et al. 2000). A cultivation-based enrichment study of sulfur oxidizers from saline production water of Canadian oil fields yielded sulfur oxidizers related to the epsilon-proteobacterial genus Arcobacter and the gamma-proteobacterial genus Thiomicrospira, often in co-culture with sulfate-reducing bacteria of the genera Desulfovibrio, Desulfomicrobium, and Desulfobulbus and of the family Desulfobacteraceae (Voordouw et al. 1996). It is unlikely that these oxygen- and nitrate-respiring, sulfur- and sulfide-oxidizing bacteria survive within fully anoxic, reduced petroleum reservoirs; they would require some admixture of oxidants by groundwater or production water circulation. However, once oxygen and nitrate are supplied, these bacteria can regenerate sulfate by oxidizing hydrogen sulfide or other reduced sulfur species and provide the electron acceptor for sulfate-reducing populations that oxidize petroleum hydrocarbons (Voordouw et al. 1996). Methanogenic enrichments and isolates are often obtained from hydrocarbon-rich sediments and deep oil reservoirs. Generally, methanogens reduce a limited spectrum of low-molecular-weight carbon substrates (CO2/H2, formate, acetate, methanol, and methyl groups, in some cases ethanol) to methane. Unlike sulfate-reducing bacteria, methanogens are not oxidizing petroleum hydrocarbons directly, but they occur consistently as community members of hydrocarbon-degrading microbial communities, where they play an essential role in complete degradation of alkanes by defined bacterial/archaeal consortia. Pure culture isolations of methanogens from oil fields have often resulted in moderately thermophilic or thermophilic, CO2/H2-utilizing methanogens, in particular new species of the genera Methanobacterium, Methanococcus, and Methanothermococcus (reviewed in Magot et al. 2001; Dahle et al. 2008). The hydrothermally heated petroleum-rich sediments of Guaymas Basin have yielded hyperthermophilic, CO2/H2 autotrophs of the genus Methanocaldococcus, with optimal growth temperatures between 80 and 90 °C (Jeanthon et al. 1999; Jones et al. 1983, 1989). These repeated isolations of hydrogenotrophic methanogens suggest that hydrogen is an important methanogenic substrate in oil fields and hydrocarbon-rich sediments. Members and close relatives of the acetoclastic genus Methanosaeta are also consistently detected, either by pure culture isolation (Magot et al. 2000), as enrichments (Zengler et al. 1999), or molecular phylotypes (Dhillon et al. 2005; Watanabe et al. 2002). Strictly anaerobic, sulfate-free incubations with Guaymas Basin sediments yielded sediment-free stable methanogenic enrichments that were growing on hexadecane as sole substrate (Zengler et al. 1999). This oxidation of unbranched long-chain alkanes amounts to a strictly anaerobic microbial alkane cracking process that most likely proceeds via syntrophic anaerobic alkane degradation to acetate and hydrogen, coupled to acetoclastic and CO2/H2 methanogenesis (Parkes 1999; Zengler et al. 1999). Thus, the methanogen communities are performing the terminal methanogenic remineralization steps in a complex network of syntrophic hydrocarbon degradation pathways, where the alkane-activating reactions and its microbial catalysts remain to be identified. The methanogenic enrichments growing in the laboratory on hexadecane contain Methanosaeta- and Methanoculleus-related 16S rRNA phylotypes (Zengler et al. 1999) and show a similar hydrogen- and acetate-utilizing methanogen community as the Guaymas sediments themselves (Dhillon et al. 2005). Consistent with a hydrogen-utilizing methanogen community, most of the bacterial 16S rRNA gene sequences in the alkane cracking Guaymas enrichment were members of the deltaproteobacterial genus Syntrophus, which grows in syntrophic association with H2-consuming methanogens. As demonstrated by laboratory enrichments at 28 °C, microbial alkane cracking does not require high temperatures (Zengler et al. 1999); this process could be widespread under mesophilic conditions. For example, methanogenic degradation of short-chain alkanes (C6–C10), monoaromatics, and intermediate-size alkanes (C14, C16, C18) in oil sand tailings proceeded toward complete oxidation at ca. 20 °C (Siddique et al. 2007, 2011). This model of methanogenic hydrocarbon degradation occurring predominantly via syntrophic oxidation of alkanes to acetate and hydrogen, followed by H2/CO2 and acetate-dependent methanogenesis, is consistent with results of several, mutually independent microbial community studies. In hydrocarbon degradation experiments using laboratory microcosms with crude oil from North Sea oil fields (Jones et al. 2008), the archaeal community was dominated by hydrogen-oxidizing methanogens (86–87% of archaeal 16S rRNA gene phylotypes), with a minority of acetate-utilizing methanogens (6–13% of archaeal 16S rRNA gene phylotypes); the bacterial community was again dominated by Syntrophus spp. This community composition and their 13C-isotopic imprint on biogenic methane were consistent with the predicted δ13-isotopic signature of biogenic methane and CO2 pools in field studies (Jones et al. 2008). Similar results have been obtained for oil-contaminated groundwater at the bottom of an underground crude oil storage cavity in Japan (Watanabe et al. 2002). Here, ca. 50% of all archaeal phylotypes obtained with a wide range of archaeal 16S rRNA primers were members of the hydrogen-utilizing family Methanomicrobiales; 7% were nearly identical (99% 16S rRNA gene similarity) with the acetoclastic species Methanosaeta concilii, and 17% were nearly identical to the methylotrophic species Methanomethylovorans hollandica (Watanabe et al. 2002). The dominance of members of the Methanomicrobiales has been confirmed in a 16S rRNA survey of offshore oil reservoirs in California (Orphan et al. 2000). Here, 86% of all archaeal phylotypes fell into the Methanomicrobiales, closely related to the methanogen Methanoplanus petrolearius, a species that was isolated from an oil well (Ollivier et al. 1997); 4% of all archaeal phylotypes were related to the Methanosarcinales (Orphan et al. 2000). There is some evidence that the spectrum of available hydrocarbons influences the types of methanogens that are enriched during syntrophic degradation. Adding the short-chain alkanes C6–C10 to primary enrichments from oil sand tailings resulted in the enrichment of acetoclastic Methanosaetaceae, whereas adding the mixed monoaromatics benzene, toluene, ethylbenzene, and xylene resulted in the enrichment of hydrogenotrophic Methanomicrobiales (Siddique et al. 2012). Until recently, a fundamental difficulty of the “microbial alkane cracking” model persisted: The organisms that anaerobically oxidize and assimilate the alkanes have not been explicitly identified, but were presumed to be bacteria by default since no alkane-oxidizing archaea were known, and methanogens were assigned a supporting role as syntrophs that consume hydrogen or acetate. Clone library sequencing, single-cell sequencing, and metagenomic analysis of syntrophic methanogenic enrichments had consistently yielded Deltaproteobacteria related to the genera Syntrophus and Smithella (Zengler et al. 1999; Gray et al. 2011; Siddique et al. 2012; Embree et al. 2014). Considering the evidence, the critical alkane-oxidizing community members could be members of the genera Syntrophus and Smithella, a possibility that remains consistent with genome annotation of Smithella (Tan et al. 2014); alternatively, alkane-oxidizing archaea hiding in plain sight could have been mistaken for methanogens or remained concealed within the “unidentified” background. It turned out that these possibilities do not exclude each other. Metagenomic sequencing and gene expression analysis of a long-chain n-alkane (paraffins, C28–C50)-oxidizing consortium have so far provided the strongest evidence that bacteria related to the genera Syntrophus and Smithella are the key players (Wawrik et al. 2016). Dominant community members of this paraffin-oxidizing consortium include bacteria of the fermentative genus Smithella and the sulfur-reducing genus Desulfuromonas, and methanogenic archaea of the hydrogenotrophic genera Methanoculleus and Methanolinea, and the acetoclastic genus Methanosaeta (Wawrik et al. 2016). The key enzyme alkylsuccinate synthase that catalyzes anaerobic alkane activation via fumarate addition was found in the Smithella genome and was also expressed during paraffin degradation. Metagenomic reconstruction supports the following scenario for the syntrophic Smithella strain: Electrons derived from beta-oxidation of the activated alkanes undergo reverse electron transfer to produce hydrogen or formate, possibly via an electron transfer flavoprotein to a membrane-bound FeS oxidoreductase, and from there to a periplasmatic formate dehydrogenase/hydrogenase. Acetate produced after beta-oxidation from acetyl-CoA is excreted and converted to CO2 and hydrogen by the syntrophic Desulfuromonas strain. These endergonic hydrogen- and acetate-producing reactions are then coupled to exergonic hydrogenotrophic or acetoclastic methanogenesis, to drive the combined reaction of methanogenic paraffin oxidation to CO2 (Wawrik et al. 2016). The Syntrophus strain forms a sister lineage to the cultured Syntrophus species S. gentianae, S. buswellii, and S. aciditrophicus and is most closely related to Smithella propionica (Wawrik et al. 2016), a fatty acid-oxidizing fermentative bacterium that converts propionate to acetate, CO2, and methane in syntrophic methanogenic co-culture (Liu et al. 1999). The euryarchaeotal candidate genus Syntrophoarchaeum that completely oxidizes n-butane and propane provides the best example for archaea as the primary agents of short-chain alkane oxidation. This archaeon and its HotSeep-1 bacterial syntroph were enriched from Guaymas Basin sediments on n-butane, selected by dilution to extinction, and finally maintained in sediment-free minimal medium with n-butane as sole carbon substrate at 50 °C (Laso-Pérez et al. 2016). Syntrophoarchaeum spp. use modified types of methane-coenzyme M reductase for butane activation; previously, mcrA genes were known as the key gene of methane activation in anaerobic methane oxidation and – in the reductive direction – of reducing the cofactor-bound methyl group to methane (Laso-Pérez et al. 2016). The butane-activating mcrA variant of Syntrophoarchaeum is related to other mcrA forms found in members of the Bathyarchaeota, indicating lateral gene transfer of mcrA genes between the Euryarchaeota and the Bathyarchaeota, two different archaeal phylum-level lineages (Evans et al. 2015). Recently, metagenomic screening of Guaymas Basin sediments detected novel mcrA gene versions related to the gene variant of Syntrophoarchaeum, but hosted by an archaeon of the GoM-Arc-1 cluster within the Euryarchaeota (Dombrowski et al. 2017). Novel types of mcrA genes are also associated with recently discovered lineages of methanogenic archaea, such as the cultured Methanomassiliicoccales (Borrel et al. 2014), the Candidatus lineage Methanofastidiosales (Nobu et al. 2016), and the candidate phylum Verstraetearchaeota (Vanwonterghem et al. 2016). Exploring the physiology, genomics, and habitat range of short-chain alkane-oxidizing archaea is work in progress. The recent detection of entirely novel linages of mcrA genes in Guaymas Basin, so far not assigned to a specific microorganism, indicates the existence of further, yet unknown methane−/alkane-oxidizing archaea (Lever and Teske 2015). New mcrA gene types related to those found previously in members of the archaeal phylum Bathyarchaeota (Evans et al. 2015) have been detected in hot springs of Yellowstone National Park (McKay et al. 2017). While the identity of these archaea is not known with certainty, the mcrA gene phylogeny would be consistent with new types of Bathyarchaeota (McKay et al. 2017). The physiological function and genomic context of new mcrA gene variants remain to be explored by enrichment, isolation, and [meta]genomic analysis of these archaeal candidates for methane and alkane oxidation. 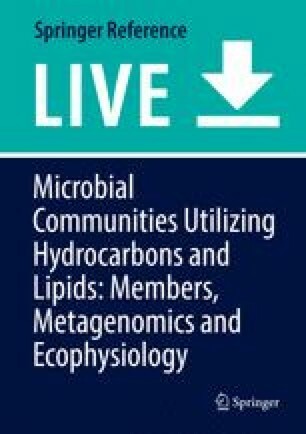 Our presently sketchy understanding of hydrocarbon substrate utilization, microbial physiology, and ecosystem function at Guaymas Basin, in the Gulf of Mexico, on subsurface hydrocarbon reservoirs, and in other microbial habitats with a significant hydrocarbon imprint would benefit most from the enrichment, pure-culture isolation, and physiological study of not-yet-cultured bacteria and archaea. On top of the wish list, one might put the pure culture isolation of anaerobic, methane-oxidizing archaea, or the consortia that they are forming with sulfate-reducing bacteria. Methane-oxidizing archaea are so consistently associated with hydrocarbon seeps of all flavors that they can be regarded as the signature organisms of these environments (Knittel et al. 2005). In the absence of pure cultures or pure consortia, basic questions about these archaea remain unanswered or remain at the stage of interesting working scenarios: the links between gene presence and actual expression and regulation of methane-producing vs methane-oxidizing pathways (Hallam et al. 2004) or the physiological basis for novel, multiple bacterial symbioses involving methane-oxidizing archaea (Pernthaler et al. 2008). High on the wish list would be the identification of bacteria and archaea that are capable of microbial ethanogenesis and propanogenesis, thermodynamically feasible biologically processes that take place in organic-rich, methanogenic marine subsurface sediments (Hinrichs et al. 2006). On the level of biochemistry and cell physiology, the genetic diversity, enzymatic function, and environmental imprint of novel anaerobic hydrocarbon degradation pathways are an inexhaustible research field that benefits enormously from the availability of diverse hydrocarbon-oxidizing sulfate-reducing bacteria as model systems (Widdel and Rabus 2001; Muyzer and van der Kraan 2008). The identification of key metabolites in environmental samples will help to link pure culture studies and field results on microbial community composition and activity (Gieg and Suflita 2002). This approach would be particularly powerful when combined with metagenomic exploration of natural hydrocarbon-degrading communities and enrichments, to identify novel community members and their genomic blueprint (Dombrowski et al. 2017). New detection methods for active hydrocarbon-degrading cells and populations – such as the BONCAT approach that is already proving highly useful for methane-cycling archaea – would open up new avenues to explore chemical and physical stimuli that influence cellular activity (Hatzenpichler et al. 2016). Finally, the isolation and biochemical study of anaerobic, thermophilic archaeal alkane oxidizers will elucidate the high-temperature range of alkane oxidation and assimilation, a field of particular interest due to the elevated temperatures in many hydrocarbon reservoirs. Andreas Teske was supported by NSF (Biological Oceanography 0647633 and 1357238 for Guaymas Basin; Emerging Frontiers/Microbial Observatories: Microbial Interactions and Processes 0801741 for the Gulf of Mexico) and by the Gulf of Mexico Research Institute [GOMRI] through the ECOGIG [Ecological Consequences of Oil and Gas input into the Gulf of Mexico] consortium.